In seeming contradiction to its name and original point of reference, street art has long since conquered the gallery space. 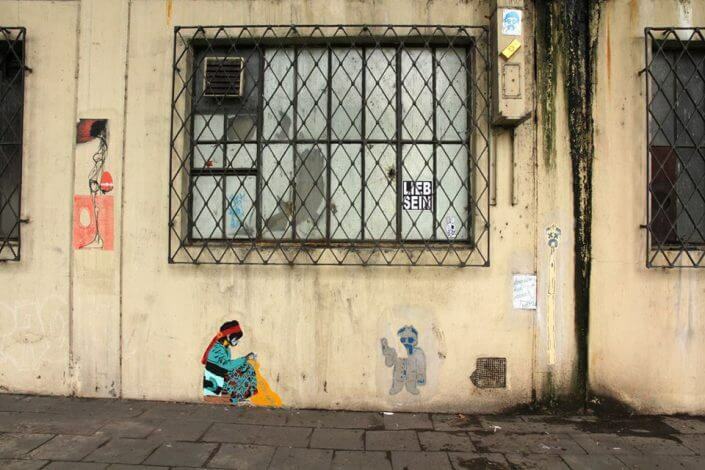 In there, one may often recognize the same motives and materials already known from the streets. And yet, presenting one’s work in an indoor space also always issues an entirely new challenge to street artists who accept the dare by creating specially devised artworks or by immediately painting and building into the white cube. Often enough, their work will not remain restricted to the exhibition space, but rather pushes back outside in order to paint and paste the streets anew. 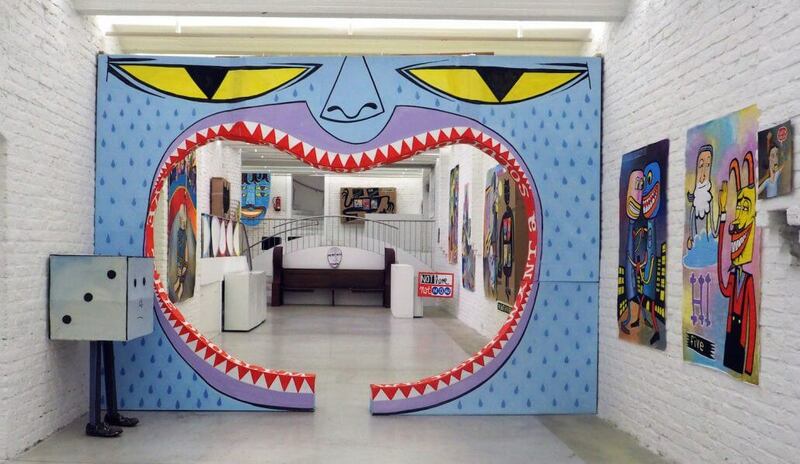 Cologne is home to a stunning number of galleries and initiatives dedicated to street and urban art. 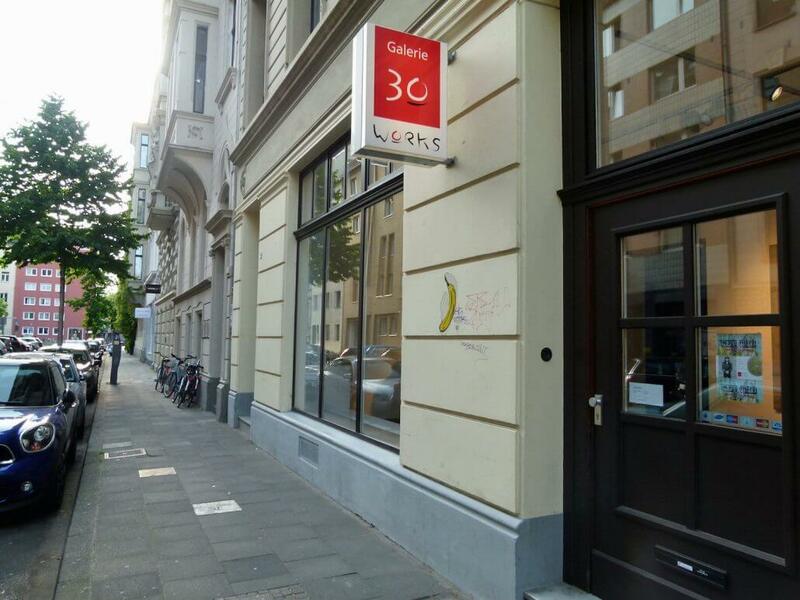 In the following, I would like to introduce you to some of the most exciting and innovative Cologne spaces and exhibition projects for the urban arts. 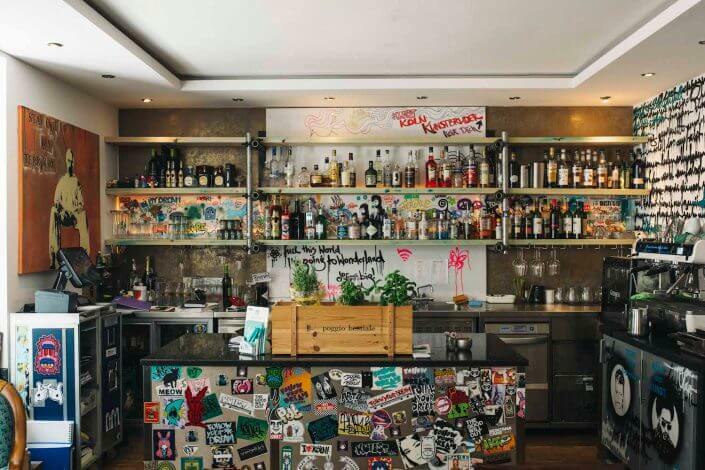 Dropping by is a must for every aficionado! The gallery on Pfeilstraße is home to two veterans of the Cologne street art scene: „Banana sprayer“ Thomas Baumgärtel who has been spraying his banana stencil all over Cologne since the 1980s and xxxhibition, who makes his appearance with ever new motives and media on the streets of Belgian quarter. Already in front of the gallery xxxhibition has inserted several of his plates into the pavement thus guiding passers-by straight into the exhibition space. 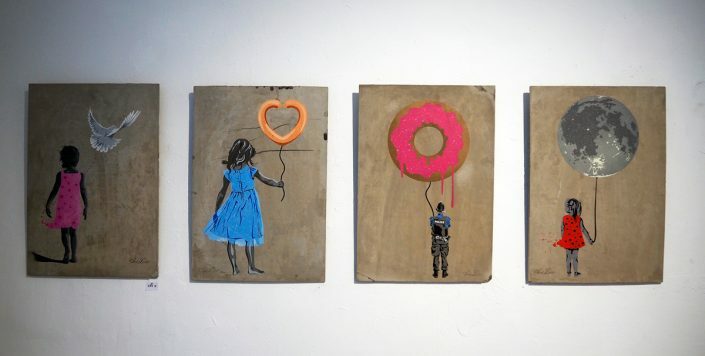 Yet apart from these two, gallery owner Gerard Margaritis represents a large stock of artists that ranges from German street artists such as EMESS, mittenimwald, Alias, L.E.T., Van Ray, and Decycle to international protagonists AVone, Mister P or Tankpetrol. Murals, stencils and paste-up works by artists represented by 30works gallery may be found all over Ehrenfeld and Belgian Quarter. Inside the new exhibition space in Ehrenfeld, gallery owner Nils Müller, himself known for his photographic documentation of the graffiti scene, time and again presents works by a number of famed street artists. 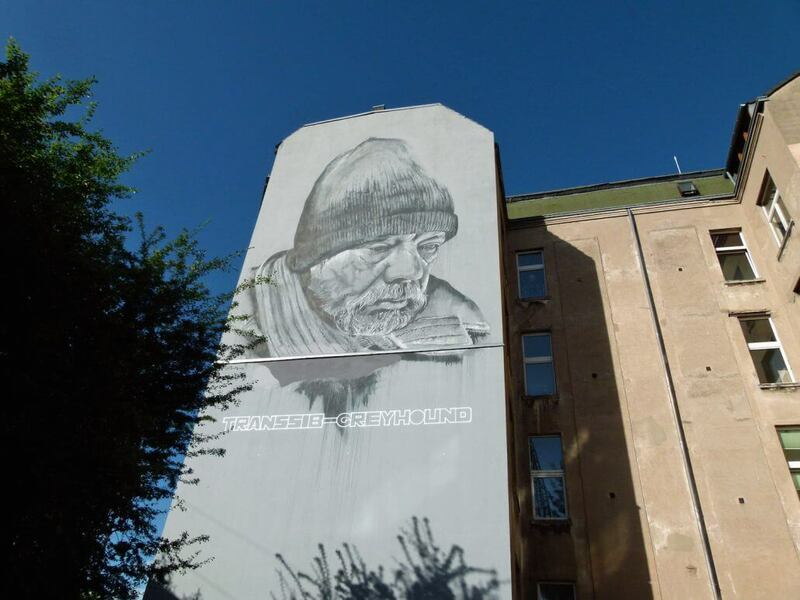 Among them are US-American artists Mark Jenkins and Brad Downey, noted for their lifelike figures and urban hackings, respectively, as well as Hendrik ECB Beikirch, who has made a name for himself with his super-sized portrait works on giant urban surfaces. In the backyard of the gallery’s former location in Bismarckstraße 70 one may discover Beikirch’s largest mural in Cologne. 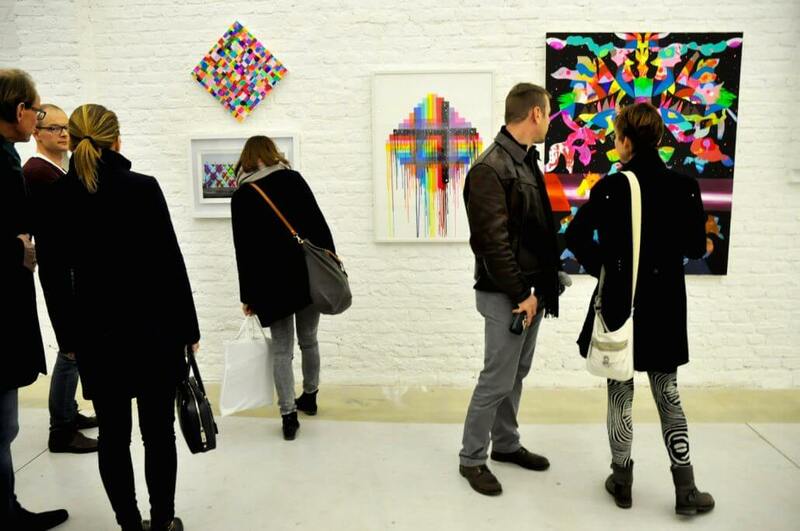 Just around the corner, pop-up gallery POP;68 continues to show smaller exhibitions. Former „Museum für verwandte Kunst“ has recently changed its name to the more catchy „KUNSt&So“. 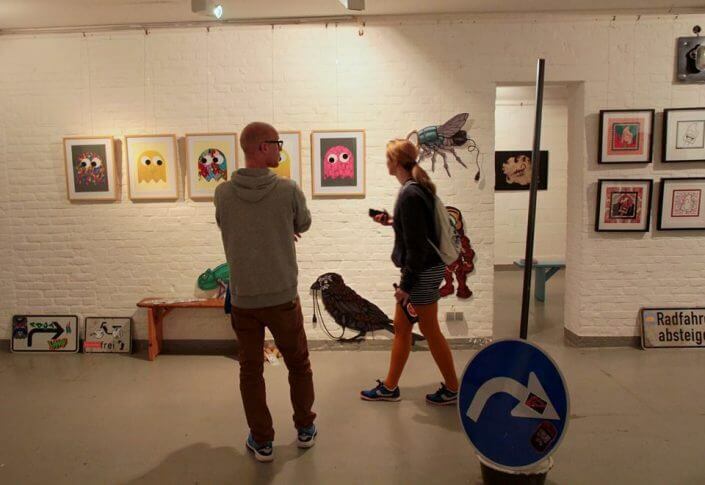 Since 2014 the small location at the heart of Cologne’s Belgian quarter is headed by a young team consisting of Pola Bergmann and Jantina Lipphardt who have focused on exhibiting works of local and regional street artists in the cosy atmosphere of their art space. 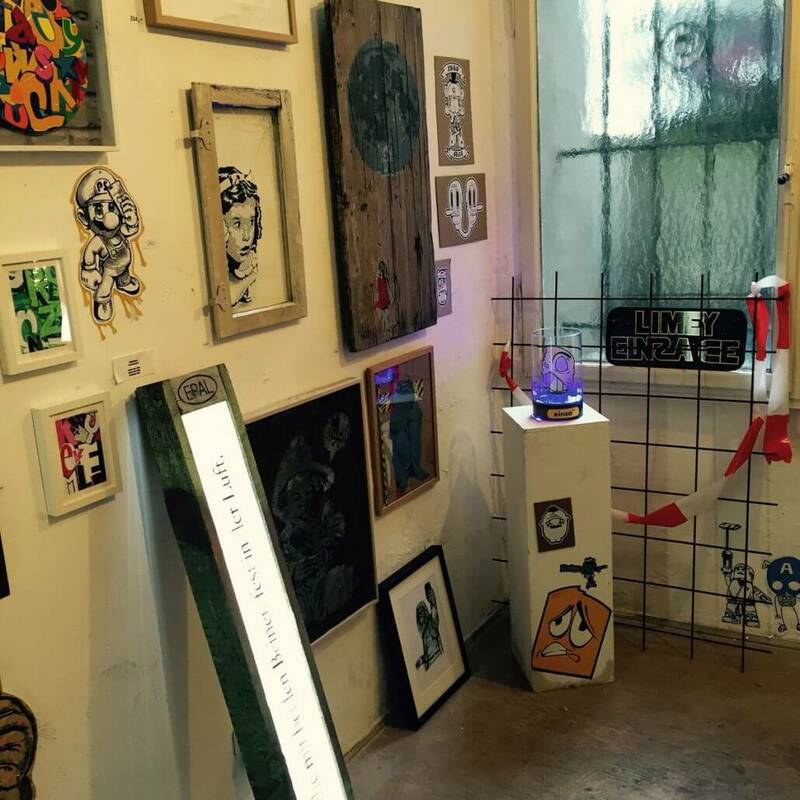 In the wake of „WallStreet“ group show in summer 2016 „KUNSt&So“ has developed into a monthly gathering place for the Cologne Street Art scene. 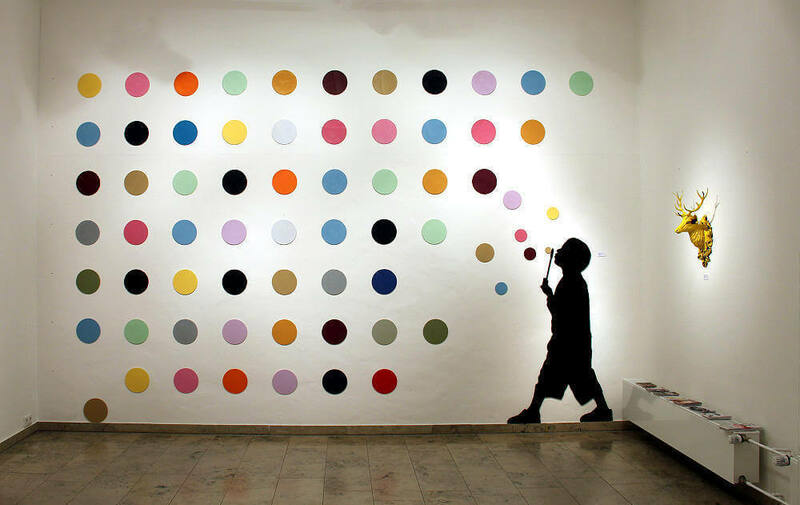 As a consequence, many artists have left their marks in the form of countless paste-ups, stickers, stencils and small murals not only inside, but also in the place’s entry area and backyard – many motives should be familiar to those regularly roaming the streets of Cologne for street art. Smaller artworks and design objects are offered in the on-site art shop. 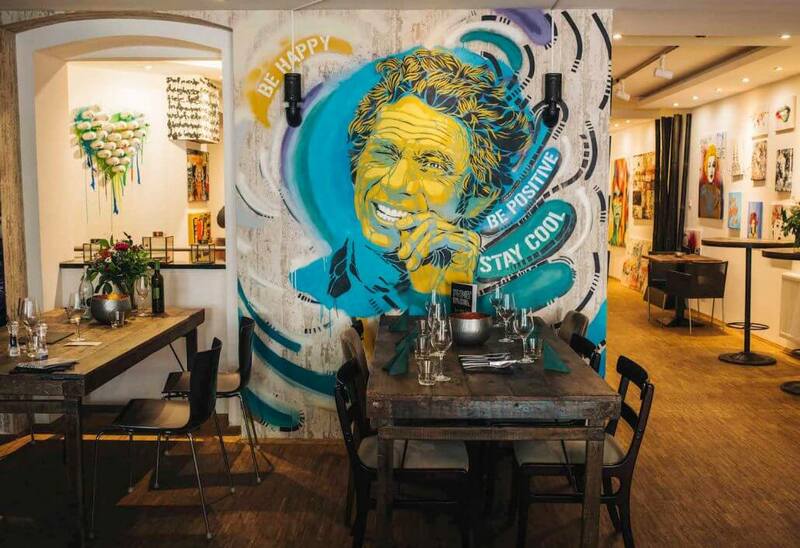 This new space for street art is also a restaurant! Close to Rudolfplatz visitors may not only rejoice in culinary street food delicacies, but also in regularly changing exhibitions by local street artists and graffiti crews. 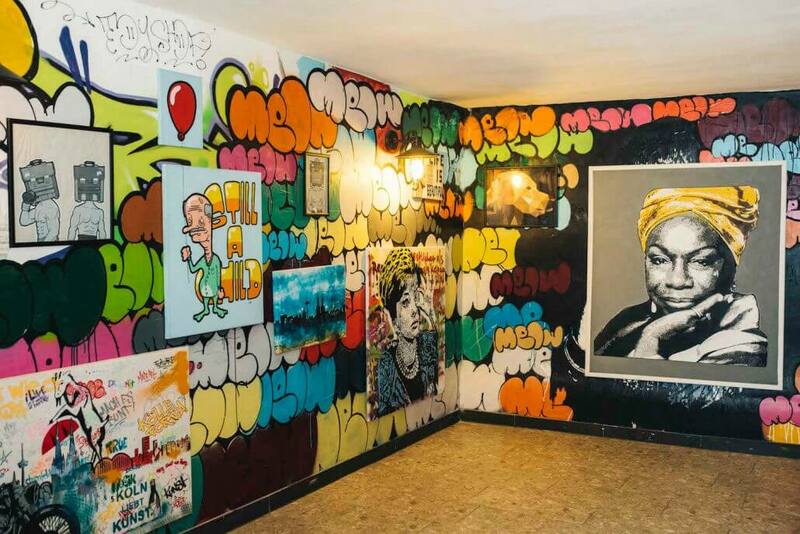 Murals, spray can installations as well as countless canvases and stickers make this place bubbling over with creativity, yet do not away with its cosy living room feel. 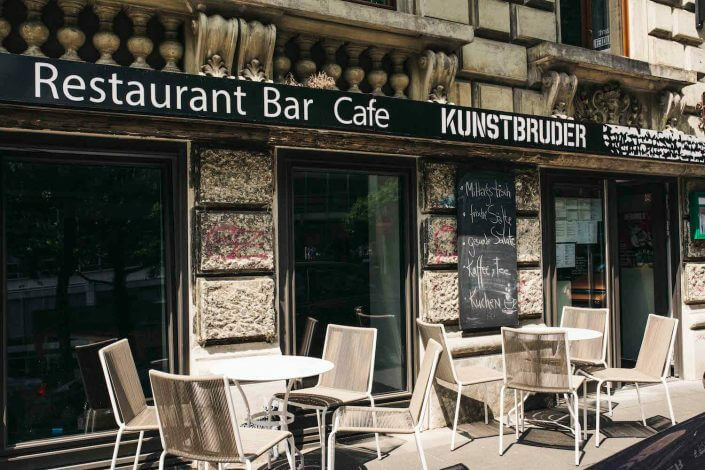 Small concerts and theatre events round up Kunstbruder’s rich programme. Works by most artists associated may be purchased at the Kunstbruder shop (Roonstraße 96) or via the online store. Initiated by Cologne street artist Tim Ossege aka SeiLeise, Straßengold (street gold) considers itself first of all as a forum for street art in and around Cologne. However, parts of its concept are also regular exhibitions. 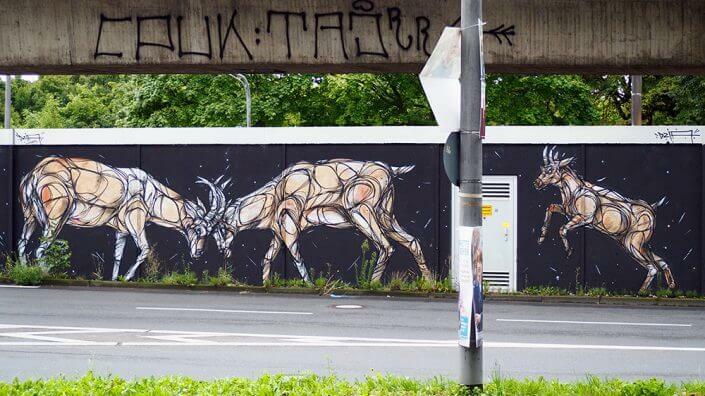 The first two of them were realized at Kulturbunker Mülheim and featured the who is who of Cologne’s lively street art scene. Together with their colleagues from all over Germany, they have also left their marks all across Mülheim, a district located on Cologne’s eastern bank of the Rhine. Especially around Kulturbunker, Carlswerkstraße, and beneath Mülheim bridge there are loads of artworks to be discovered! 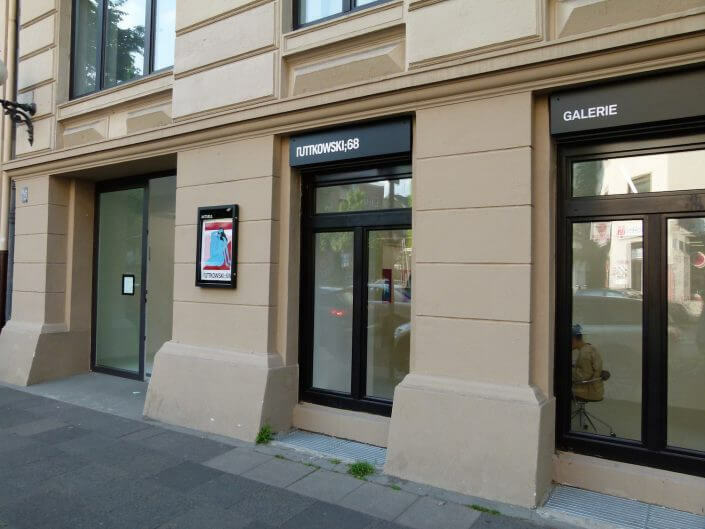 Important note: Unfortunately, the gallery Kunstagentin is closed. Anne Scherer aka Die Kunstagentin has been active as a curator on the street art scene for years and is thus an expert in the field. After curating the very first edition of CityLeaks Urban Art Festival in 2011 she opened her own gallery at the heart of Cologne’s Belgian quarter. Inside the gallery’s spacious vault she regularly sets up exhibitions of such renowned street artist as Smash137, Vhils, Maya Hayuk, Tilt, Swoon, Boris Hoppek, SatOne or Hense, most of which have already painted large murals in the streets of Cologne. 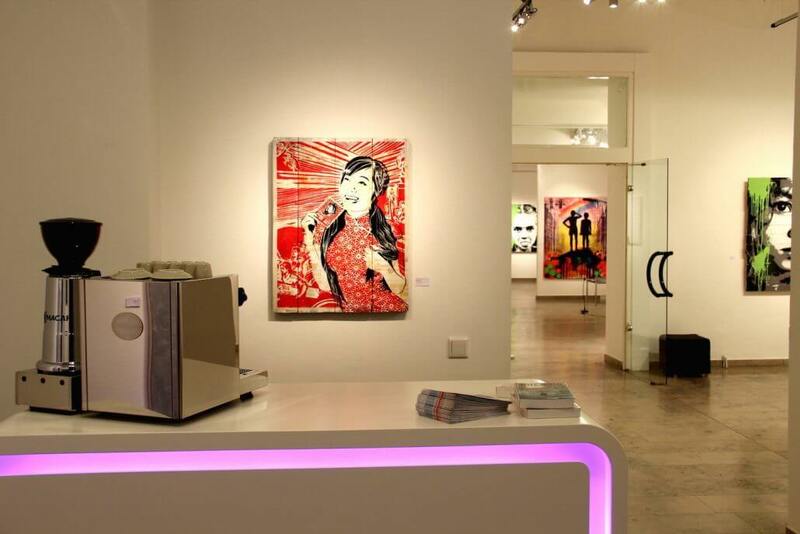 The gallery’s stock of artists is constantly enriched by new talents such as Agostino Iacurci and Know Hope in 2016, but also features German pop art veterans Stefan Strumbel and Jim Avignon.